During the indoor season, courses take place at our indoor venue on Friday evenings from 18:30 to 20:00. In the summer, they take place outdoors on a Wednesday evening. These sessions are suitable for anyone between the ages of 8 to 80 years old, who is relatively fit and active. The programme consists of a maximum of six sessions. We offer several courses per year throughout both the indoor and outdoor seasons. These are popular and, as spaces are limited, they are often over-subscribed (although we do hold a waiting list in case of drop-outs). Any enquiries about the dates of our upcoming beginner's courses and the availability of spaces on them should be addressed to training@lalehamarcheryclub.co.uk. The first session is an opportunity to see you if you like it - a "taster session" if you will. This is identical to the first session of the full 6-week course and counts as week 1 if you decide you want to complete the course, as we are sure you will! The cost per person for the first session is just £10 and payment of the balance of £40 per person will be taken at the second session. Please note that we can only hold spaces open for up to 8 weeks from your first week, although if you let us know you are unable to complete the six sessions of the course within 8 weeks, we can usually make a separate arrangement with you. The programme provides an introduction to the sport, covers range safety and provides beginners with instruction so that they can safely participate in Archery. On successful completion of the training programme, beginners who join the Club may shoot alongside the seasoned members, and start to hone their skills. All successful beginners (i.e. 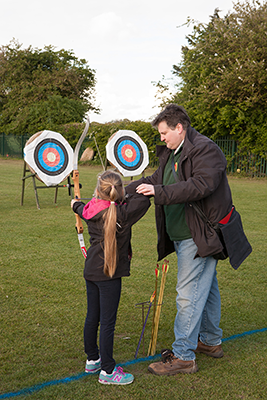 those who can demonstrate the required level of competence) will receive a ‘Certificate of Achievement’ from the Club, whether or not they choose to join Laleham Archery Club. Please note that, once the beginner's course is over, access to Club equipment for new members is limited to Club nights and organised Club shoots only. New members are encouraged to obtain their own equipment as soon as possible, in order to make the most of their membership. For beginners who do decide to join the Club, coaches and experienced members are available to give advice regarding the purchase of equipment. If you are interested in coming along to join us for either the full course or just for the "taster" session, please fill in the form below, giving us the name of those wishing to take part, and if they are under 18 years old, please also let us know their age.